IF YOU'RE like me, at the start of every new year, you resolve to eat more healthily. If you're like me, that New Year's resolution crumbles faster than you can say chocolate cake. And if you're like me, you have the best intentions to do something about what you eat, but you're not quite sure how to go about it. This is where some expert advice can come in handy. Just in time for the start of 2017, Dale Pinnock, "the Medicinal Chef”, has written How to Cook Healthily. "The purpose of this book is to help you make sense of what healthy dishes look like, how they are composed, and what cooking methods you can use to create a healthy dish and get the best out of your ingredients,” Dale says. So it seems Dale, who has degrees in Human Nutrition and Herbal Medicine and a Masters in Nutritional Medicine, has hit the nail on the head. A lot of us like the idea of eating healthily but when it comes to what we should actually put on our plates, it can be overwhelming about where to start. This is a very user-friendly cookbook which covers the best cooking techniques, explains what's beneficial in various ingredients, and features a wide range of savoury and sweet dishes. A lot of these recipes I'd be happy to eat, such as home-made dim sum, beef satay, and mini coconut cake bites. And they don't look that hard to make either. So maybe this year will be the year! 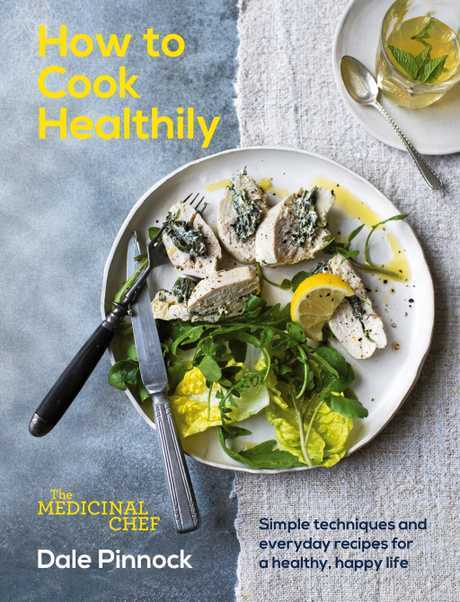 This is an edited extract from How to Cook Healthily by Dale Pinnock published by Hardie Grant Books, RRP $39.99, and is available in stores nationally from January 1. Scoop the flesh of one half of the avocado into a small food processor along with the lemon juice, wasabi, 2 tablespoons water (or a little more to make it runnier) and salt and pepper to taste. Blitz to a smooth, creamy, pourable dressing. Dice the remaining avocado half. 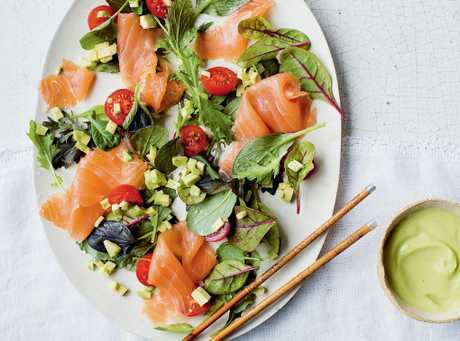 Combine the salad leaves, tomatoes, smoked salmon and diced avocado on a plate and dress with the avocado wasabi dressing. This is a lovely, super-simple way of getting your good fats in. Crisp and satisfying.